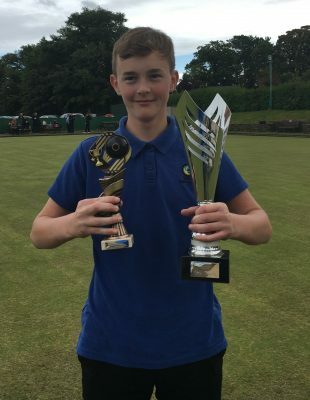 The Junior Manx Masters was held on Saturday morning at South Ramsey, with 15 juniors taking part, with Glenn Boland (Nobles) overcoming the challenge of current Junior Manx Champion Harry Barton (Marown) with a 11-5 victory in a good quality final. It was an excellent morning of bowling, with the early stages split into three groups of five, with the three group winners automatically qualifying for the semi-final, along with a runner up from the three groups who had the best aggregate. Glenn didn’t have it all his own way, after a narrow defeat in the group stages against Bethany Kennish, Boland kept his cool to take the last spot in the semi-final courtesy of results in his other group games, showing he had not let his head drop despite the setback. In the semi-final Glenn managed to end the challenge of last years winner Bethany Kennish, whilst Harry beat Austin Hart to book his place in the final. At the conclusion of play the presentation was made by John Kennish, who thanked Stonemasons IOM Limited for the generous sponsorship, all those who were there to support the juniors.